ELMETHERM is a vertical oven manufacturer, who provides turnkey equipment for reduced floor spaces for your thermal applications from 40°C (100°F) to 350°C (660°F). 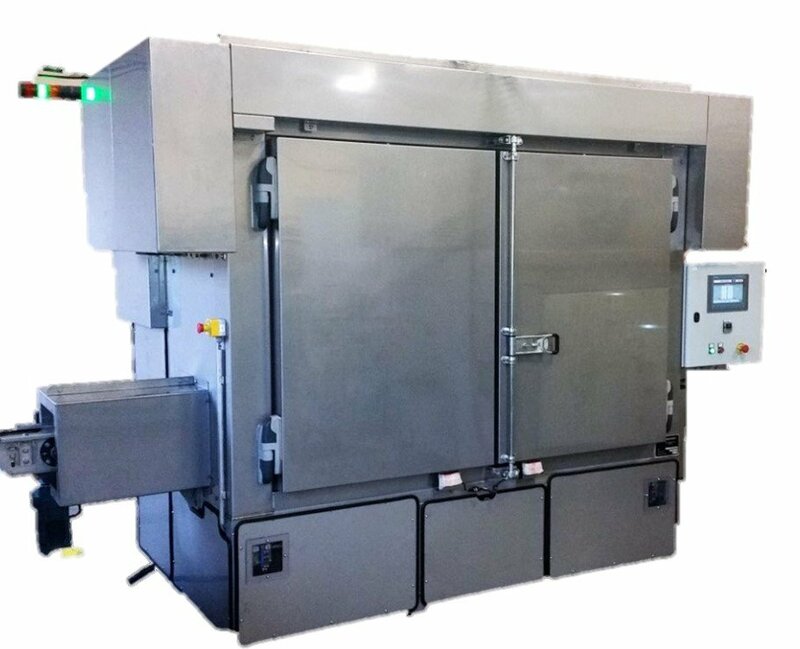 These equipments (vertical ovens, tower ovens) help you to minimize floor space while providing excellent temperature uniformity, reliable mechanics, low maintenance and easy access. 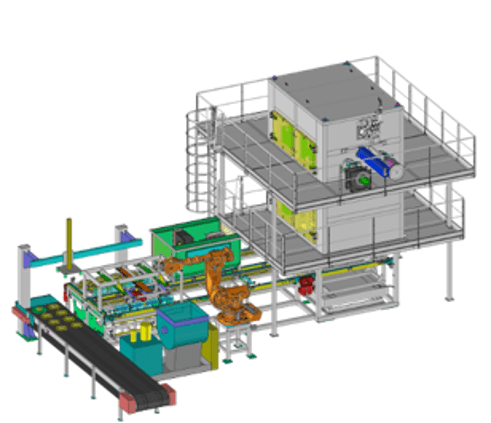 Operations realized by robot, manipulator, conveyor or operator. Loading and unloading at one side or on two separate side of the oven. Internal or external loading and unloading stations. Heating by gas burner or electrical resistances rack. Vertical oven can be divided into several heating zones with different temperatures. Vertical oven can integrate a cooling zone: natural cooling by ambient air or by fan blown convected air (with cooled air or ambient air). Vertical oven, "stacked tray oven"
Industrial oven with a vertical conveyor : the products are put on trays that are stacked into two tray piles; the stacked trays are conveyed vertically; lateral displacement for changing between tray stacks; conveying to and from the loading and unloading stations. 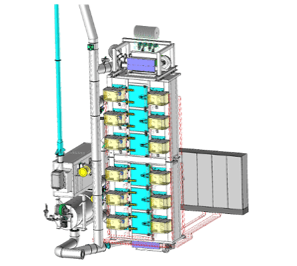 Extremely compact, this concept based on stacked trays enables to reach higher temperatures as the trays are displaced without any chain conveyors. All the mobile mechanical parts are located outside the heating zone. Industrial oven with a vertical conveyor: the products are put on swing trays that are fixed on conveyor chains moving according a paternoster pattern. 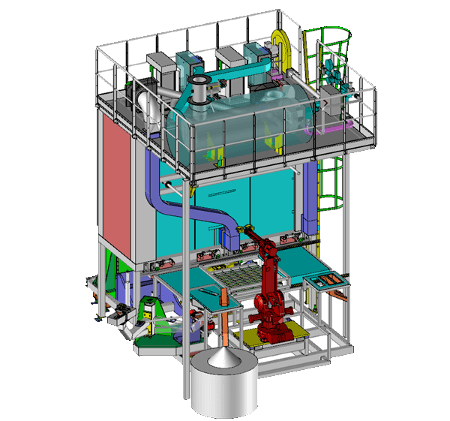 Compact and proven thermprocess soution, the paternoster oven is an economical solution for numeruous industrial processes. Two chain conveyors equipped with steel corners take in charge the trays with the products placed on them. 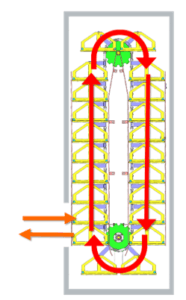 The first chain system ensures the conveying to the top; the second one to the bottom. Change of chain system realised by a shuttle located at the top of the oven. 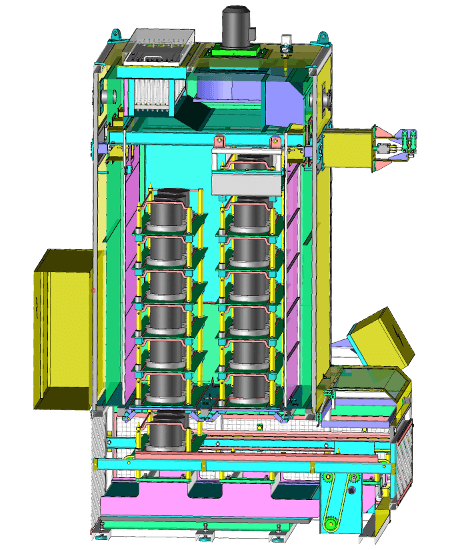 Our vertical ovens can be used for numeruous applications : polymerisation, drying, annealing, vulcanisation, curing, preheating, heat treatment, stabilisation, homogenizing, ageing. Vertical tray oven for curing at 300 °C. Gas heated. Robotized loading and unloading at one place of the oven.2 heating zones. Recovery and incineration of VOC. 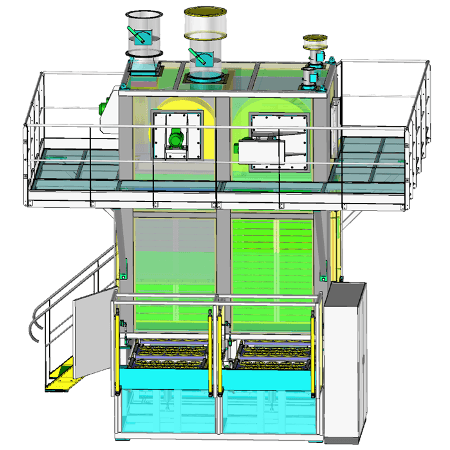 Vertical trays oven for polymerisation. Manual loading and unloading at two separate stations. Vertical trays oven for preheating at 220 °C. Manual loading and unloading at one side of the oven through a secured hatch. 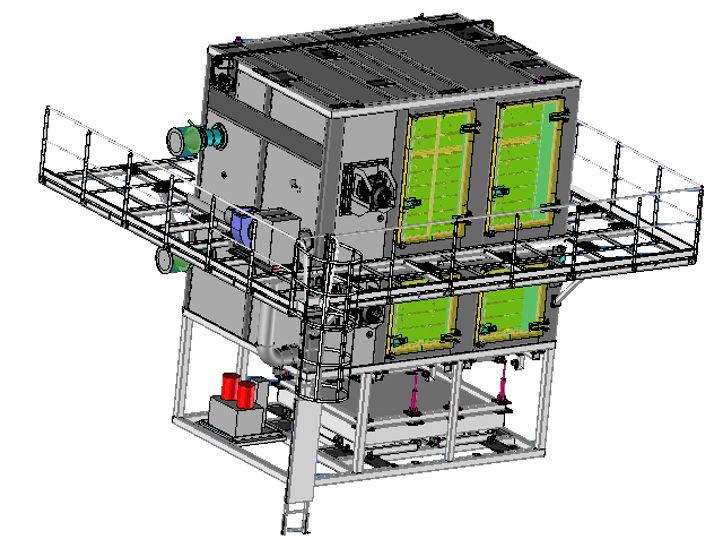 Vertical paternoster oven with swing trays for stabilisation at 100 °C. Manual loading and unloading, conveying by steps, secured station. Vertical paternoster oven : schematic drawing about paternoster pattern. 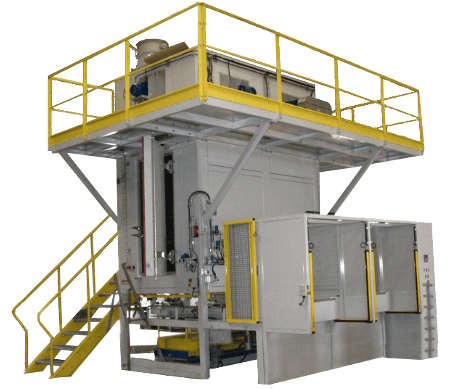 Vertical trays oven for drying of coated foundry sand cores. 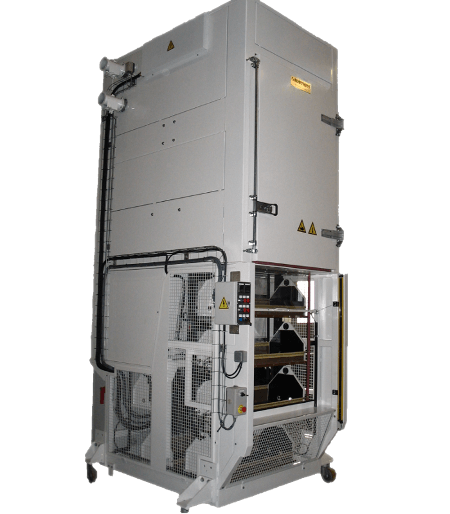 Special vertical oven for the drying of PTFE coatings on medical components. Continuous vertical oven for curing. The trays are cumulated and then conveyed vertically into the oven. Vertical oven with stacked palets. Drying of coatings on foundry cores. Two piles of palets stacked. Top transfer between tray stacks.